I didn’t come to England for 29C heat in October…I have to giggle as they brag about the heat on the morning news. While it isn’t exactly ‘hot’ I wouldn’t call it Autumn weather, but then I don’t think my first English summer was typical either. What better way to sooth my weather-related anxieties than by cooking up a lovely batch of Scotch Eggs. Or rather, asking my sister VC to. 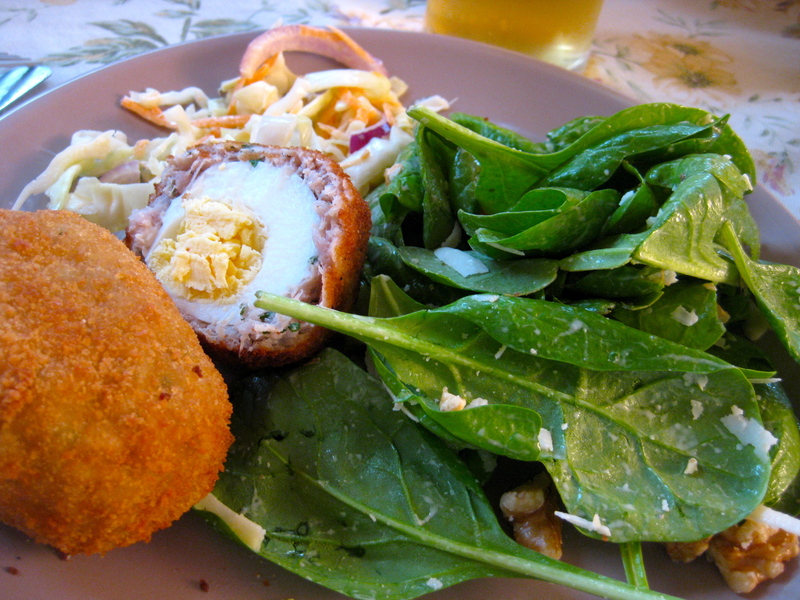 Scotch Eggs are boiled eggs rolled in sausage meat, crumbed and fried. Madness I tell you. Brilliant madness. They tasted pretty good, milder than I expected. Served at room temperature and accompanied with a creamy coleslaw and spinach salad they made a lovely ‘mild weather’ meal. I must admit that I probably didn’t need to eat two….but then, it was dinner time. Here are some recipes from some classic British food sources BBC Food and Nigella Lawson and Delia Smith. I think scotch eggs would make great after school snacks for ravenous teenagers, a quick and easy lunch on the run at work and perfect for any picnic. The only concern with these little protein bombs is to take care to have the right temperature oil to prevent undercooked sausage meat. Egg and tuna mix with avocado works as a light lunch or breakfast. First Boil the eggs loosely. Third Mix the eggs with a can of tuna, mayonnaise, salt and pepper.